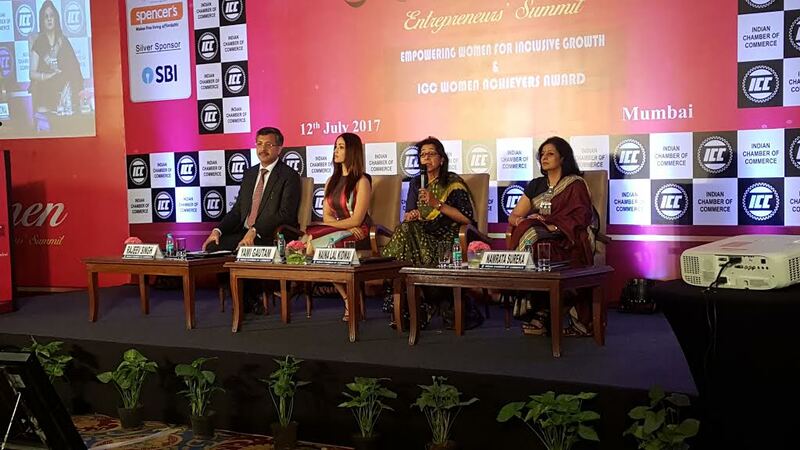 The “Women Entrepreneurs’ Summit & ICC Women Achievers Award” was organized by the Indian Chamber of Commerce (ICC) on 12th July 2017 at Mumbai. The summit aimed to explore the role of entrepreneurship in empowering women for an inclusive growth path of the economy. Focused on ‘Critical Issues of Women Entrepreneurship’ and ‘Women Entrepreneurs & Investors & New Age Technologies’: Indian Chamber of Commerce. The conference was graced by Ms Naina Lal Kidwai, Chairman, Max Financial Services; Mr Krish Iyer, President and CEO, Walmart India; Ms Yami Gautam, Renowned Indian Actress and Ms Uma Shanmukhi Sistla, General Manager (SME), State Bank of India. In recognition of her outstanding achievements, Ms Kidwai was honoured with the ‘ICC Women Achievers Award in Business Excellence & Social Inclusiveness’. Ms Kidwai, drawing instances from her own professional experience and personal life illustrated how qualities like passion, ambition, humility, hard work and integrity, freedom from the fear of failure and time management are crucial for becoming successful. She stated that personal failures should not dampen the spirits of a women entrepreneur. She also mentioned how a working mother can find a balance between the home front and her workplace. Indian Chamber of Commerce also felicitated Ms Yami Gautam, the renowned actress, with the ‘ICC Women Achievers Award in Excellence in Indian Cinema’. While interacting with the audience, Ms Yami Gautam mentioned that self belief and clarity of thought are very essential for success in any field irrespective of the profession. Mr Krish Iyer, President & CEO, Walmart, in his speech mentioned, that the global investors are really looking forward to invest in India at the moment. Demonetization and GST implementation has been a great enabler and will lead to long term benefits and all these factors are creating great opportunities for the Indian women with an entrepreneurial streak. Walmart is supporting women entrepreneurs and startups globally and in India too they have been promoting women entrepreneurship and training the women employees. Ms Uma Shanmukhi Sistla, General Manager (SME), State Bank of India mentioned that women entrepreneurship is the need of the hour and for becoming a successful women entrepreneur; creative thinking and risk taking is essential. Entrepreneurship is one of the most significant drivers for growth and development of an economy. It plays a pivotal role in empowering women, towards fostering an inclusive growth path for the economy. India currently ranks 29th amongst 146 countries across the globe on the basis of Gender Inequality Index. Prime government initiatives to promote women empowerment in the country include Jan-Dhan Yojna, Mudra Yojna, Stand-Up India and the National Mission for socio-economic empowerment of Women. The summit discussed contributions of leading corporates in empowering the women workforce through skill development, capacity creation, financing and market linkages.